Ainsworth Projects appointed MGM Ltd in September 2017 to complete a full refurbishment of a redundant three story building in a suburb of Ashington, Northumberland. The building had been previously a block of individual flats for private rent, and originally was a social club for the area. Over the years, there had been many attempts at a partial refurbishment and isolated repairs, and the building required a thorough overhaul to ensure that it was fit for purpose, aesthetically pleasing and free from defects. The building contains some interesting and challenging features such as faience blocks to the front elevation and a light well area which was the original beer cellar in the buildings original form. The scope of the works required for a wide range of trades to complete the project, and the efficient programming of the works was pivotal to ensure all trades were able to work in a logical manner. This project also utilised modern construction systems such as a wireless fire alarm and detection system throughout. This system enabled for minimal disruption to the existing surfaces and an efficient installation. The building was planned to be utilised for sheltered accommodation, and this had to be considered in the overall design and completion of the project. As part of the works, the building was reconfigured to provide a staff reception area with fully integrated CCTV and remote door entry. The first floor of the building was also reconfigured to incorporate a sleepover area including shower room for the comfort of the staff. Originally, the scope of works requested that the large rendered areas to the rear be decorated, but once access was available it was decided that full render replacement was required. This took the form of a through colour Monocouche Render which is aesthetically pleasing whilst also minimising any future maintenance issues due to the integral colour of the product. Works were completed at the end of 2017, with all nine individual apartments planned to be in use through the beginning of 2018. 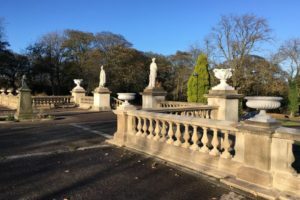 We were employed to carry out restoration works when in February 2017, vandals caused outrage as they targeted the balustrades on the historic Victorian Terrace at Leazes Park in Newcastle City Centre. Leazes Park is Newcastle’s oldest public park with the Victorian Terrace being an important focal point. The Terrace was first commissioned back in April 1879, and still to this day, is used for special events with the bandstand and foliage forming an impressive backdrop. The Terrace is made from an early type of stone and granite fixed cement. A full restoration review of the Victorian Terrace was made by a specialist team wherein other essential repairs where identified. The commissioning of these works was extremely important as specialist skills and techniques were needed to replicate the original methods of construction. Works were completed on time and in budget which will guarantee residents, park users and visitors to Leazes Park will enjoy the exquisite example of heritage for years to come. Ford Castle is a medieval castle set in the rolling countryside of Northumberland, and is now an outdoor residential centre for school children. Steeped in history, the castle itself has belonged to the Lord Joicey family since 1907 and sits on the Ford and Etal Estates. It has been operated since 1956 as an Outdoor Education Centre, first by Northumberland County Council and since 2012 by the Chateau Beaumont Group. We worked continuously at Ford Castle during 2015/16 on a variety of different elements of the historic buildings. Internal works to the castle have included a variety of heritage trades including lime plastering and various joinery works. The joinery works that were carried out internally have included both structural and aesthetic items across a multitude of rooms/areas. Externally, a great amount of works have been carried out to the roof areas and the castle structure including boundary walls and outbuildings. Given the nature of the construction, our stonemasons have been continually occupied over the contract duration attending to various elements such as crenulations, lime pointing and stone rebuilding. Given the nature of the construction, our stonemasons have been continually occupied over the contract duration attending to various elements such as crenulations, lime pointing and stone rebuilding. This project required the use of specialist trades, and MGM directly employ a number of specialist heritage tradesmen which allows a continually high level of performance to be gained on projects of this nature. MGM Ltd were invited to tender to deliver this historic project for English Heritage on one of the world’s heritage visitor sites. MGM were employed to redevelop the existing building. Works included M&E, structural alterations, new floors, insulating the existing walls and loft with Kingspan insulation, rebuilding various elevations of stonework, timber repairs to floors and roof, external landscaping, installation of new timber windows and decoration. Site requirements meant that during winter period operatives had to stay on site in lodgings. Access by vehicle was impossible due to the snow. Working closely with the clients team works are were completed ahead of programme and the building was completed for the official opening day. Works were all completed well within the client’s budget and funding. Open day held during works for public to view works from a safe area. MGM Ltd were employed on Phase 2 in preference to the most competitive tender to redevelop and extend the existing building. This was as a direct result of our ability to deliver the Housesteads Museum Contract (Phase 1). Being part of a World Heritage Site, we worked with the archaeologist on works being done to the ground under a watching brief. We were then employed to carry out Phase 3 – this phase of the project consisted of a new toilet block refurbishment, raise the single storey building to a two storey building to create a glazed mezzanine dining area, a glazed oak and glass canopy providing protection to visitors. Up the hill from the visitors centre is the museum, where we carried out major alterations and refurbishments consisting of new floors, new arched entrances, film theatre, offices, heating and ventilation system and installation of roman artefacts. Phase 4 then followed consisting of external works in new footpaths and step access ways along with disabled adapted access to each building on site. Souter Lighthouse an iconic North East lighthouse’s appointed us to carry out works to the historic Lantern Room just in time for its 100th birthday. Souter Lighthouse has stood tall and proud on the North East coast between South Shields and Sunderland for the past 144 years. Famed as the world’s first purpose built electrically powered lighthouse when it opened in 1871, it was the wonder of its age. But the metal and glass domed Lantern Room, added in 1915 when Souter was converted from electricity to high pressure oil which saw the light’s range increased from 17 to over 20 miles, is in need of urgent repair. The original diamond shaped bespoke glass panes were restored and conserved or replaced with historically accurate replicas where necessary, corroded metalwork renovated and the whole lantern room painted inside and out. Work took ten weeks with scaffolding being built up the exterior length of the red and white painted round tower before the dome itself is covered in a protective layer of plastic. The lighthouse was open throughout the 10 week project and visitors had full access to the tower except for two of the weeks, when the work of stripping back decades of paint is due to took place. This is the first time any major work has been carried out on the Lantern Room since 1915. But the rest of the lighthouse has undergone some quite dramatic changes in its near century-and-a-half’s existence. The renovation work was funded by the National Trust’s Neptune campaign, the charity’s most successful fundraising campaign ever which for the past 50 years has helped to save some of our most beautiful, dramatic and diverse shorelines. While the lighthouse perched high on cliffs above the North Sea is no longer operational, all the machinery still works and is on show to visitors along with the tower and a reconstructed Victorian keeper’s cottage. There’s also an open air play area complete with a small beach with deck chairs, fun activity trails and regular hands-on events. Last year was Souter Lighthouse’s most successful with more than 28,000 visitors attracted by a diverse programme of family-friendly events. New build of six bedroom dwelling with swimming pool, spa, gym and cinema. Structural enveloping works including new lintels, new wall ties, repointing and rebuilding of garden walls and chimney stacks. Built in 1899/1900 and located at the heart of the original colliery complex Winding House No 2 is the Last Victorian engine house in Northumberland still containing a working winder. During this project, great care and thorough planning was required to coordinate the works around the opening times and access to the museum by members of the public. The 29 properties are at Hillside, Wilton Gilbert which is 5 miles east of Durham City Centre. They are a mixture of house types with external construction of brickwork with a render finish. The internal walls are of brick and block work construction. The project involved the installation of external insulation, rendering and pebble dashing. Management of scaffolding, NEDL to ensure all cables were insulated and protected as necessary. The properties were all occupied during the works with tenants inducted and visited. MGM Ltd tendered and won the scheme due to its renowned expertise to fully restore and alter the building for its change of use. Works progressed as programmed and the buildings were handed over on time and within budget.